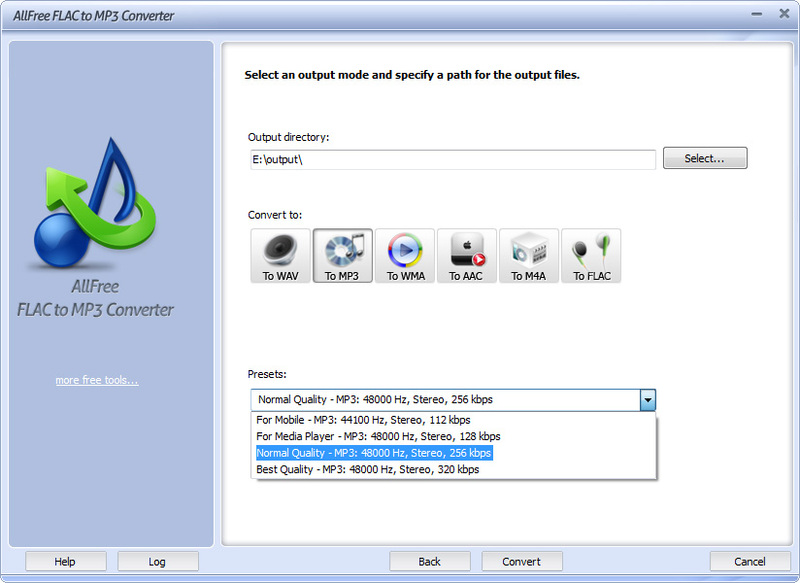 All Free FLAC to MP3 Converter helps encode video files from the FLAC format to the MP3 format. By converting FLAC to MP3 you can create excellent music collection which is impressive in size and convenient to use and find more free space for the new songs. You are even allowed to enjoy music in video sources by extracting sound tracks from those video files.The converter supports a large amount of input formats including MP3 FLAC WAV AAC FLAC OGG APE AC3 AIFF MP2 M4A CDA VOX RA RAM TTA and much more as source formats. Any audio files can be converted to the most popular audio formats as MP3 OGG FLAC WAV etc. you want.Batch converts multiple audio files in specified order with ease. The batch process helps a lot when dealing with lots of huge size files and saves your much time. At the same time you will be released from a large amount of audio conversion work.There is no need to learn more about FLAC to MP3 conversion as the software provides frequently used presets that include frequency bitrate number of channels etc. No more confusing numeric adjustment to get the exact output quality you need.The user-friendly UI enables you to find & use anything you want in seconds and many thoughtful features (conversion list with specific media info & image preview one click to open output folder post process options to shutdown the computer or play a sound when conversion is finished etc.). The step-by-step wizard with tutorial instruction to help users convert just by clicking buttons.100% clean and free FLAC to MP3 converter - All Free FLAC to MP3 Converter makes the task of FLAC to MP3 conversion a breeze without any limitation or extra expenses and relieves you from any disturbance of adware spyware malware and viruses.